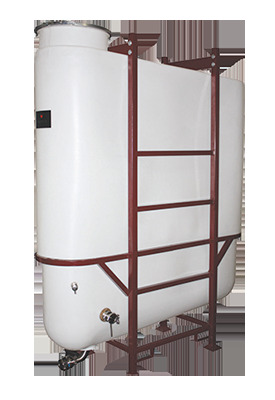 The Flextank Cell is designed to provide excellent space utilization when set up in rows and stacked 2 high. A 2 high stack uses 0.85 sq. ft. per barrel compared with 1.25 sq.ft. per barrel when stacked 6 high on barrel racks. They include fork truck pockets. For safety reasons it is advisable to put the upper tank in place empty and then fill it. Reverse the procedure when draining. The standard frame finish is hot dipped galvanized or a Burgundy powder coat, as shown, at no additional cost.